Yesterday morning, the New-York Historical Society previewed the totally transformed fourth floor of its Upper West Side museum—once a drab archive, it will soon host 100 Tiffany Lamps in a space designed by London- and Prague-based architect Eva Jiřičná. The creation of the Gallery of Tiffany Lamps was spurred by the discovery that Clara Driscoll, one of the “Tiffany Girls” (women who worked for Tiffany Studios and selected the glass fragments that went into the lamps), was a leading creative force and designed many Tiffany lamps herself. 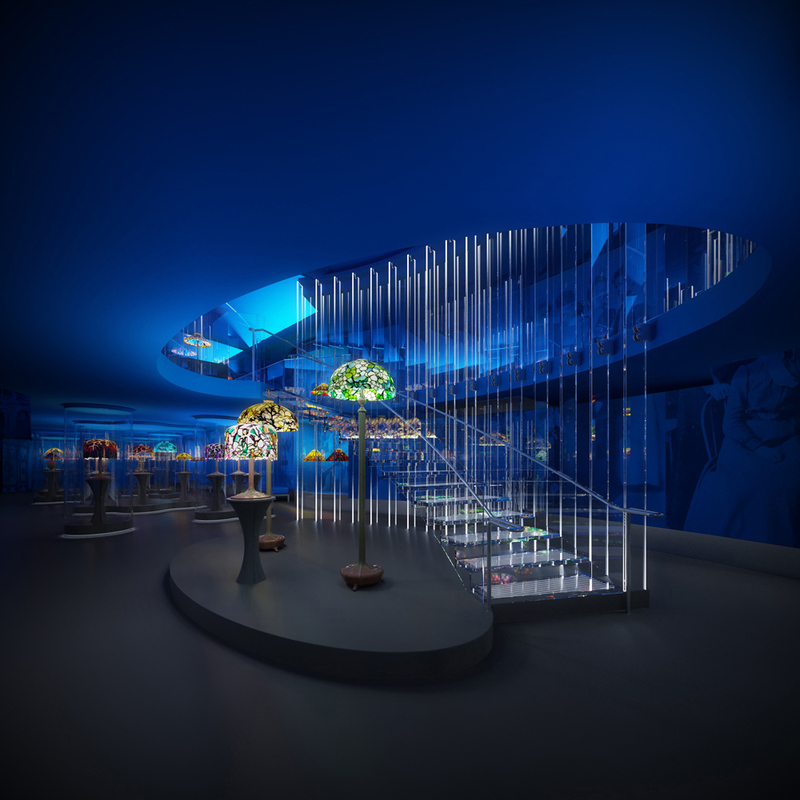 New York City–based PBDW were the architects of record for the 4,800-square-foot, two-story gallery, which features specially-crafted curving glass displays surrounded by a low-light environment and dark blue walls. Jiřičná's firm, who has come to specialize in glass construction, designed the LED-lit stairs with absolutely minimal metal details. In most instances, the stair's glass-to-glass metal connections are encased within the layers of laminated glass panes, making them totally flush and well-hidden. Furthermore, the stair's glass hangs off the nearby wall and works in tension. A small amount of give was engineered into the steps for users' comfort when walking upward. 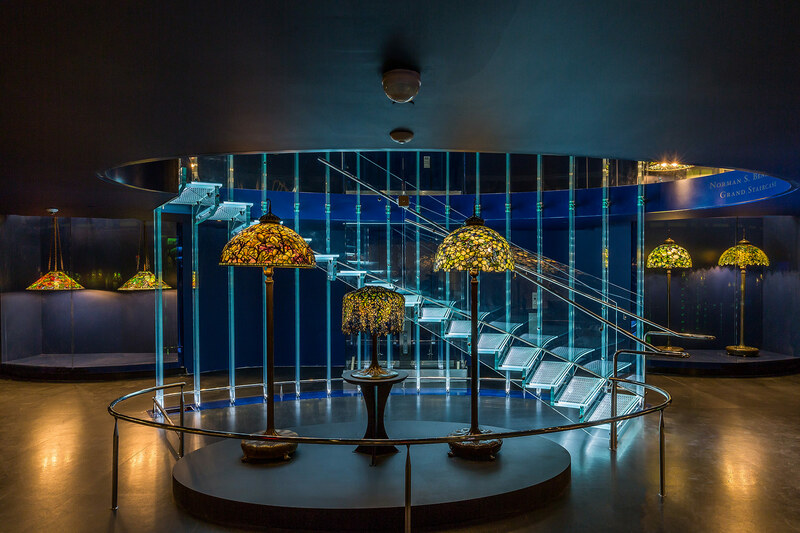 Georgina Papathanasiou, an associate at Eva Jiřičná Architects, said the staircase was "a feat of technology in the 21st-century" to match the technical achievement of Tiffany's 20th-century creations. In addition to telling the history of the Tiffany Girls and Clara Driscoll, visitors can create their own Tiffany lamp through an interactive digital installation (created by Cambridge, Massachusetts–based Small Design firm Inc.) on the second floor. 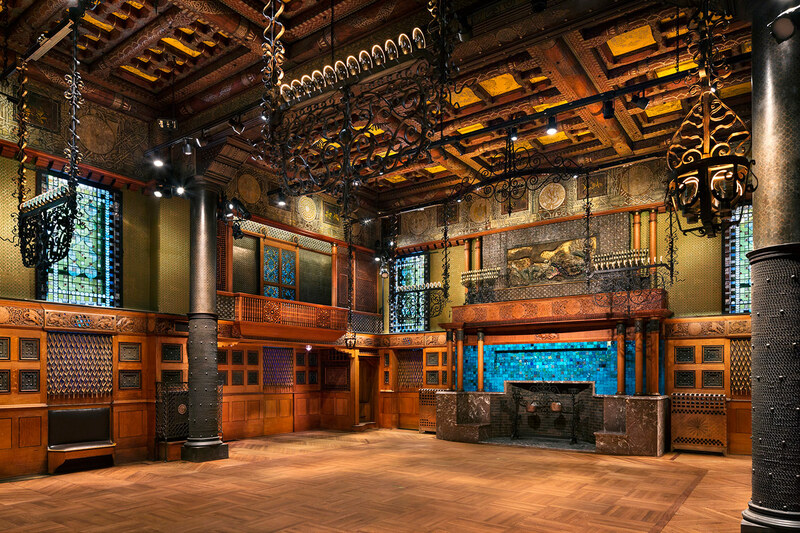 The Gallery of Tiffany Lamps is adjacent to the also-new 1,500-square-foot Joyce B. Cowin’s History Gallery, a space dedicated to exhibitions organized by the New-York Historical Society’s Center for Women’s History. The newly-established Center is the first institution of its kind dedicated to public exhibits on women in American history. (The Joyce B. Cowin’s History Gallery will be inaugurated with Saving Washington, an exhibition on First Lady Dolley Madison, along with items from the archives of Billie Jean King, an interactive multimedia wall, among other artifacts.) Lastly, a new North Gallery will showcase objects from the museum's permanent collection. All the galleries will open to the public on April 29. Louis Comfort Tiffany is synonymous with the lamps that bear his name. However, a recent discovery about the lamps' origins helped shape a new exhibition space currently under construction at the New-York Historical Society. It was well-known that Tiffany employed dozens of women—known as "Tiffany Girls"—to carefully select the glass fragments that went into Tiffany lamps, one of the many types of objets de luxe his company produced. (Tiffany thought women had a better eye for color.) However, letters discovered in 2005 and written by one such Tiffany Girl, Clara Driscoll, revealed that she was a leading creative force in the lamp studio and designed several lamps herself. Now, the New-York Historical Society's 100 Tiffany lamps will be celebrated in a new gallery that will stand adjacent to the also new 1,500-square-foot Joyce B. Cowin's History Gallery, a space dedicated to exhibitions organized by the New-York Historical Society's Center for Women's History. The newly-established center is the first institution of its kind dedicated to public exhibits on women in American history. Both spaces will be located on the museum's fourth floor, which was previously an archive. London and Prague-based architect Eva Jiřičná, who designed the Jewellery gallery at the V&A, is behind the Gallery of Tiffany Lamps, with New York City-based PBDW as architects of record. Specially-crafted curving glass displays, surrounded by a low-light environment and dark blue walls, will let the lamps shine unencumbered. The 4,800-square-foot, two-story Gallery of Tiffany Lamps will also feature an all-glass curving staircase lit by LEDs. Its glowing structural glass steps, risers, and vertical fins will fit together with minimal metal connection details. In addition to telling the history of Clara Driscoll and the Tiffany Girls, visitors will be able to create their own Tiffany lamp through an interactive digital installation. The Joyce B. Cowin's History Gallery will be inaugurated with Saving Washington, an exhibition on First Lady Dolley Madison, along with items from the archives of Billie Jean King, an interactive multimedia wall, among other artifacts. Lastly, as part of the 4th floor's revamp, a new North Gallery will host items from the society's permanent collection—such as a copper globe from 1542 that traces Giovanni da Verrazzano's voyage—in fifteen themed niches. The Gallery of Tiffany Lamps, Joyce B. Cowin's History Gallery, and North Gallery will open April 8th. A new 4th floor multimedia center, which will feature scanners, computers, a 3D printer, and more, will come online this summer. This article appears on HoverPin, a new app that lets you build personalized maps of geo-related online content based on your interests: architecture, food, culture, fitness, and more. Never miss The Architect’s Newspaper’s coverage of your city and discover new, exciting projects wherever you go! See our HoverPin layer here and download the app from the Apple Store. The New York Historical Society announced today that Czech architect Eva Jiřičná will design a new space for exhibitions and study on the 20,000 square foot fourth floor of the society's Central Park West building. The 3,000 square foot, two story gallery will showcase the society's permanent collection of Tiffany lamps. The gallery, Jiřičná's first major New York project, will feature one of the architect's signature glass staircases. The floor will also be home to complementary entities, including the Henry Luce III Center for the Study of American Culture, the Center for the Study of Women's History. The design recalls earlier work, like the Jewellery Gallery at London's Victoria & Albert Museum, and the residential interior for a client in Mayfair, London. 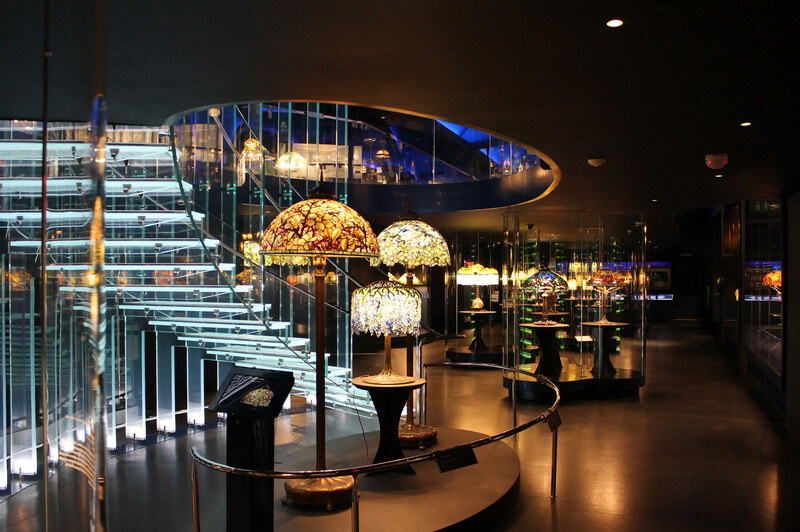 In the Tiffany Gallery, islands of curved, floor-to-ceiling glass frame each lamp while allowing a 360 degree view. To be viewed as originally intended, the lamps will be illuminated in the darkened gallery. The gallery's mezzanine, connected to the lower level's exhibition via the glass staircase, contains additional lamps and a more traditional, rectilinear program. The programming on the mezzanine will feature exhibitions on the lamp-making process. Though it sounds incongruous at first, there is a strong connection between the Center for the Study of Women's History and Tiffany lamps. Clara Driscoll and her "Tiffany Girls" designed and fabricated many of Tiffany's most famous lamps, including the Wisteria (ca. 1901) and Dragonfly (ca. 1900–1906). Jiřičná's design will unify the themes expressed in the collection. The space is expected to open to the public in early 2017.